Halo Top, the creamery that brilliantly capitalizes on your ability to devour large quantities of ice cream with its low-calorie single-serving pints, recently announced it has overthrown Ben & Jerry's and Häagen-Dazs as the best-selling pint in the US. 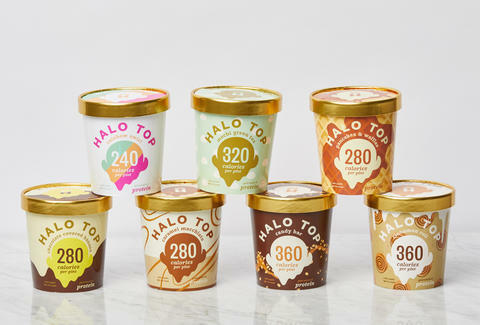 Now, the company is plotting to further dominate your late-night ice cream binges with the launch of seven new flavors. Halo Top revealed the batch of new pints on Thursday, saying all seven will roll out to frozen food sections nationwide later this month. The new flavors, including Rainbow Swirl, will join classics like Vanilla Bean, Chocolate, and Strawberry for a total of 17 flavors in the creamery's low-calorie lineup. All seven contain 20g of protein and range from 240 to 360 calories per pint, which means you can feel slightly better about eating the whole damn thing by yourself in one sitting. Keyword: slightly. Of course, few things have ever stopped you from spooning your way to the bottom of a pint of ice cream, but if for some reason you needed an excuse to do so, this could very well be it. Just try not to get brain freeze. Tony Merevick is Senior News Editor at Thrillist and has yet to eat an entire pint of this stuff, but he'll keep trying. Send news tips to news@thrillist.com and follow him on Twitter @tonymerevick.